Wilsonart® High-Pressure Laminate (HPL) can be used as a decorative surface for vertical and horizontal applications, in residential and commercial high-traffic environments. HPL is a paper-based product, created by bonding melamine impregnated decorative papers to layers of resin-treated kraft paper under high heat and pressure. In the press, decorative papers are permanently bonded to the kraft paper to form a solid sheet of laminate. HPL is commonly used as the decorative surface for countertops and cabinets, work surfaces, laboratory surfaces, backsplashes, partitions, retail fixtures, panel applications, furniture, built-ins, signage/displays, decorative wainscoting, and walls. Wilsonart offers a wide range of designs, including solid colors, wood, stone, and pattern options. Wilsonart® HD® and Wilsonart® Premium designs feature AEON™ Scratch and Scuff Resistant Performance Technology, providing 3x industry standard wear resistance, and improved scratch and scuff performance versus comparable competitive finishes. Wilsonart® HD® designs also feature anti-microbial protection built directly into the laminate, protecting the surface against damaging microbes such as mold and mildew. Wilsonart® Specialty and Performance Laminates are uniquely suited to handle the challenges of one-of-a-kind interiors. The offering includes special design options such as the Virtual Design Library. An ever-expanding collection of new designs offers rustic woods, pressed concretes, bold color-carriers, photo realistic images, abstracts and artistic graphics. For an entirely customized solution, Wilsonart offers WilsonartXYou, using your own artwork, photographs, or illustrations to create a laminate to meet all design needs. 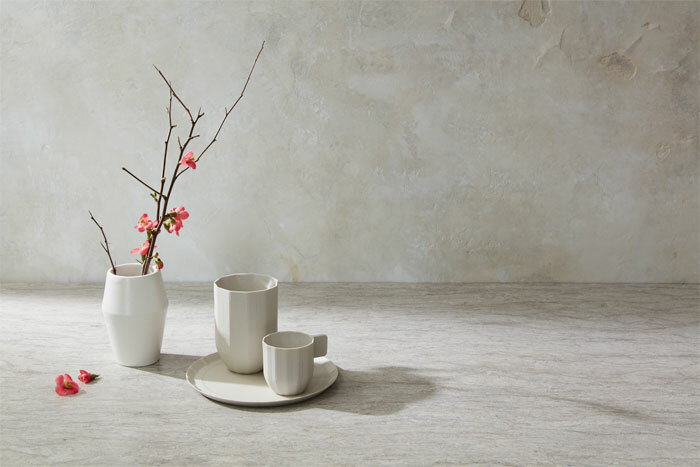 Wilsonart® Traceless™ Laminate is for surfaces that are always in the spotlight. It is a high-tech, fingerprint-resistant surface that rebukes smears, smudges, and streaks. Wilsonart® Solicor™ is a specialty laminate created with a solid color core, eliminating the “brown line” of traditional laminates. Wilsonart® fire-rated laminates are an ideal solution for environments with specific safety regulations. Wilsonart offers different thicknesses and sheet sizes ranging from the standard size of 4’ x 8’ to the large sheet option of 5’x12’ to suit application requirements. Wilsonart® Laminate carries the UL GREENGUARD Gold Certification.